As mentioned in a post a few days ago and Episode 5 of Conscious Revolution, I’m doing a juice cleanse now. Regardless of what goes through my mind on a daily basis about how I’ve eaten in the past or how I’m not eating now, there’s some great advice that my inner Lilith has to offer. When approached consciously, Lilith can teach us volumes about our relationships with our bodies. She puts our attention on what we need while in physical bodies because she connects us to a level of instinct rooted in our lower three chakras. There is primal wisdom inside us all the time and working with this part of ourselves means connecting in healthy ways with Lilith. What this looks like is that we eat when we need to and what we eat works for our bodies and makes us feel good. It also means that we stop eating for a time when our bodies need to rest. These signals – eating only when right and what is healthy as well as temporarily ceasing to eat – are with us constantly. Our bodies cannot help but communicate their needs! But all too often we don’t listen. We’ve trained ourselves out of hearing what our bodies are saying. The thing to do, then, is to open to and commit to listening. To truly hearing what our bodies have to say. As I mention in the post and podcast episode linked to above, I had been aware of my body telling me I needed to do a long cleanse/fast for about a year. I came back from a channeling tour on the West Coast on my motorcycle and had eaten in ways that made me feel sluggish and dense. When I stayed places for a day or two I ate well but to stay in my body on the highway on the motorcycle I ate foods that I knew would lower my vibration. I learned that long trips like that on a motorcycle stirred my Mercury-Neptune self into daydreaming mode and frankly I was concerned about my safety. For all 4,000 miles I worked with an affirmation to help this (“I am grounded and safe and all is well in my world”) but it wasn’t enough given the pull I felt to leave my body. It was as though the smooth ride on the interstate made me want to fly or something, and checking out of my body was seductive. There’s an irony here in that I was on a channeling tour, taking a high vibration to public events at which attendees could raise their vibrations and get tune-ups from the Ascended Master I channel, Djehuty. Those events were fantastic and I stand by the teachings and audio available through my site, but on days I wasn’t channeling I was eating in ways that proved difficult. Anyway, I returned to Tucson feeling like garbage. After that passed I began to see with more clarity than ever the emotional debris within me I had not yet learned to effectively deal with and it’s fair to say that that was what was being dealt with and learned about in the interim year. And now I feel I get it. Still a bit in process with articulating and making peace with multiple layers of emotional history but I get it. Regarding Lilith, something that matters here is that I began the cleanse/fast by listening to cues from my body. It was very clearly the right time to do it. The way I now hear my body, I knew about a week ahead of time when it would begin. I looked at my schedule and noted that the day prior I would channel Djehuty for callers on a Full Moon Grounding and Releasing call, which was August 1st. I saw clearly that the cleanse would begin August 2nd. I was sure and clear and it wasn’t just talk or wishful thinking when I let a couple of people in my life know I would begin it. Compare that with a year of knowing I needed to do it, which is the input of the brain. Always negotiating and often putting things off because it doesn’t want to deal with them or – gods forbid – temporarily give up control over my consumption patterns, the brain doesn’t want to cleanse. Since the body does and let me know it was time, I began it. Today is day 10. There’s no goal re the duration because I’m taking cues from my body. As mentioned elsewhere I’m willing to go 60 days for the deep effects of cleansing and colon health, but it probably won’t be that long. Right now it’s day-to-day and I’m happy with that. And my body is thrilled – so much energy normally used for digestion is being used for cleansing and repair. I do feel hunger now but without urgency, and I’m clear that we all need to reorient ourselves to experiencing hunger now and then without fear. If you listen, your own inner Lilith will tell you what you need. It’s your brain that gets stuck on what it wants. Do yourself a favor and put what your body tells you that you need first and let your brain take a back seat when it comes to nutrition. After all, so much of our eating when managed by the brain has nothing to do with nutrition. Your body will never steer you wrong. It will always lead you to precisely what you need. 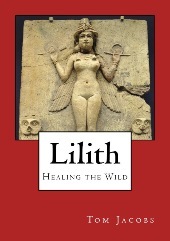 Get a signed copy of the new book Lilith: Healing the Wild from me or via Amazon or Kindle. It contains the whole story about this misunderstood and maligned archetype that represents our relationship with the wild, natural feminine. We are in fact extensions of the Earth (not brains that exist merely for ego gratification!) and in the book I explain how to reconnect with yourself as an extension of nature – a critical teaching we all need during these times of rising incidences of health concerns and failing to understand the wisdom of the natural world. That wisdom exists in our bodies and now we are challenged to return to listening to and honoring it.